Democracy for Realists: Why Elections Do Not Produce Responsive Government offers a critique of conventional wisdom surrounding popular theories of democracy. 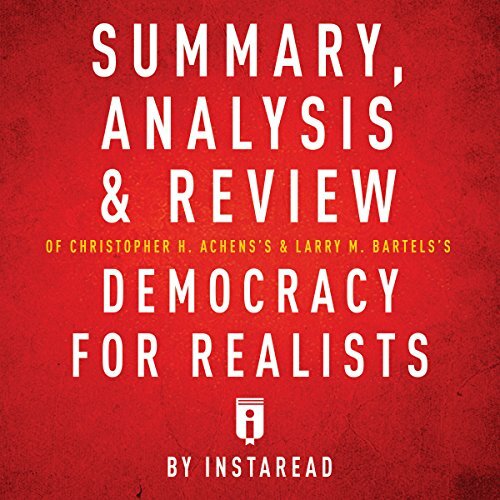 Authors Christopher Achen and Larry Bartels argue that the public, journalists, and political scientists rely on a group of common-sense understandings of democracy. The authors collectively refer to these beliefs as the "folk theory" of democracy. The folk theory presumes that people behave as engaged citizens and that election outcomes reflect public policy preferences. This assumption is inaccurate and misleading, and therefore presents a danger to democracy. Political scientists have tried in various ways to validate or systematize the intuitions on which the folk theory in based. Anthony Downs put forward a spatial model of voting, which supposes that individuals vote for the politicians who are closest to their own policy preferences.